It’s now 14 games unbeaten in the United Counties Premier Division for Deeping Rangers, but they didn’t manage to climb into second place. Deeping were held 1-1 at Outgang Road by Sleaford. Scott Coupland, with his 24th goal of the campaign, opened the scoring in the first half for the home side, but the visitors equalised after the break thanks to a 20 yard set-piece screamer from former Deeping player Joe Braithwaite. “It was a fair result,” Deeping manager Michael Goode admitted. “It was a bit of an off night for us, but Sleaford are a good side who have added a couple of good players to their squad recently. Deeping remain third in the table, three points behind second-placed Eynesbury who won 2-0 at Yaxley last night. 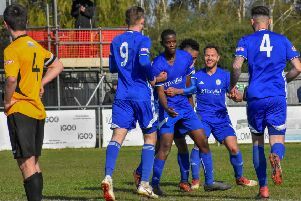 That win moved Eynesbury to within five points of leaders Peterborough Sports who have a tricky encounter at fourth-placed Holbeach United tonight (November 23). Stamford AFC were beaten 1-0 in the Doodson Cup - a League Cup competition for Evo Stik Northern League sides - at Lincoln United last night. A goal on the stroke of half time settled the contest. Lincoln Utd 1, Stamford AFC 0. Yaxley 0, Eynesbury Rovers 2. Holbeach United v Peterborough Sports. Huntingdon Town v Raunds Town.